The first day of every year is a time to dash for the seemingly best greeting card for everyone we love and care for. But are you exactly aware how the tradition of sending New Year Greetings began? Not everyone are, and if you happen to be in the same bracket, check out our informative article on the history of New Year Greetings. If you like reading about the interesting history of New Year Greetings, click here for sure to refer this page to your friends and dear ones. May you enjoy a grand New Year celebration with all you love! In the 21st century, New Year greeting cards have become a popular medium for the expression of our wishes and feelings for one another on the very first day of the year. It is difficult to pinpoint the exact time when the custom of sending greetings on New Year's Day exactly began. According to some historians, the concept of greeting cards was born in the ancient Egyptian tradition of sending wishes scribbled on simple slips of papyrus to one another via a messenger. A similar custom is believed to have existed in Greece, where messages were written on scrolls and sent to intended parties, and also in China where messages of good will were exchanged on the first day of the calendar year to wish a prosperous future for one another. By the early 13th century, handmade paper greeting cards were being exchanged in various parts of Europe. It was around this time that the Germans are believed to have started printing New Year's greetings from woodcuts and using them to exchange wishes. The popularity of greeting cards grew immensely with the introduction of the postage stamp in 1840. This immediately turned the greeting card, an item to be personally delivered till then, into a favourite of the masses and a great mode of personal communication. The advancement in printing methods around the same time helped in a large-scale production of greeting cards. Greeting cards for New Year's Day as well as for occassions like Valentine's Day and Christmas witnessed the use of intricate decoration that made them all the more beautiful. The mass-production of greeting cards in America that set the foundation for the greeting card industry in the country began with the efforts of Louis Prang, a German immigrant who set up a lithography enterprise near Boston in 1856. This innovative printer devised in the 1870s a multi-color printing process known as "chromolithography", that made possible the creation of beautifully colored greeting cards. The next few years saw the rise of several greeting card companies. With newer technologies and improvements in printing, greeting cards began to boast of a much superior quality. A New Year Greeting card of the modern era has come a long way from what it was even a quarter of a century ago. The rise of the electronic means of communication has revolutionised the concept of greeting cards. Today, a greeting card can also be sent electronically. Such greeting cards that require electronic means (computer or mobile technology) to be sent are called E-cards (Electronic Greeting Cards). Websites such as DeepestFeelings.com enable one to send Flash-based or GIF cards to the e-mail accounts of his/her recipients. More recently, services have been launched to allow one to send greetings to a mobile phone via text messages. Visit Cell93.com to get a feel of the mobile e-card. 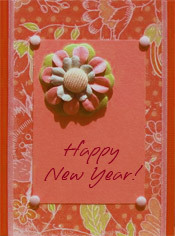 Celebrate New Year's Day with beautiful greeting cards from DeepestFeelings.com. Pick any of our exquisite New Year Cards and send it out to a loved one to wish him/her a prosperous year ahead.